Trailhead Pale Ale is a fresh hopped Pale Ale which is not bottled and according to the Fatheads website is a limited edition batch exclusive to Cleveland. (Editors Note: Fatheads has announced they will begin canning Trailhead sometime in May 2014.) As I reported earlier, this beer won a silver medal at this year’s Great American Beer Festival in the Fresh Hop Ale category. I’ve been wanting to try it since I first read about it, but I thought I might have missed my chance. 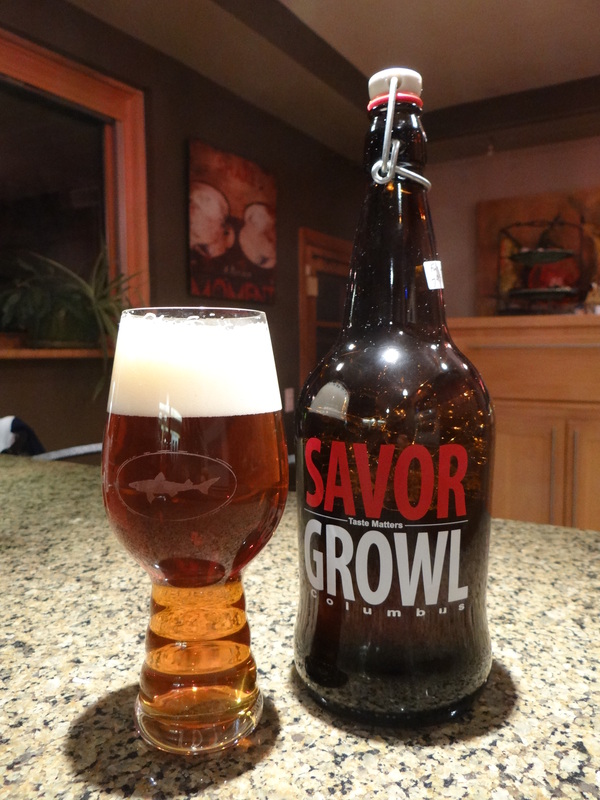 So when I was out shopping on Christmas Eve I stopped into two of my favorite Growler shops (Savor Growl and the Ohio Tap Room) and was surprised to see that both had it on tap. I didn’t hesitate to pick up a 32 oz half growler, which I promptly opened and drank after dinner on Christmas day. It’s like buying a gift for yourself. As you can see I’m also using this beer to try out the Dogfish Head IPA glass that Santa brought me for Christmas. It’s a clear amber color that pours with approximately two fingers of pure white head. The fresh hopping with whole flower Citra and Simcoe hops gives it a big nose of fresh green hops. Like other great examples of style the hop aroma is grassy, reminiscent of hemp, with notes of pine. The fresh green hops come through big time in the taste as well, it’s really what this beer is all about. The malts don’t really register on my taste buds, nor is there much bitterness, other than a slight lingering bitterness on the finish. The mouthfeel is relatively light and easy drinking. No oily mouthfeel like you get with some IPAs and DIPAs. Overall this beer does just one thing—fresh hops—but it does that thing very well. Although I can’t do a side by side comparison I think it would hold its own pretty well against Founder’s Harvest Ale, which is the standard against which I judge fresh/wet hopped beers. It’s a real treat to find this beer in the middle of winter. If you are in Central or Northern Ohio and have a chance to get your hands on this beer don’t hesitate to get some.